If you are like many others, you like to stay organized. Organization is a skill that comes easy for some people, but for others it takes work. If you have been vaping for quite some time, you have probably accumulated a variety of spare e-cig parts and pieces. Now you may be asking: What is the best way organize all my e-cig supplies and keep them in close reach where you know where they are at all times? If you lay all of your stuff out on the table, you will probably see a variety of products – empty and full ejuice bottles, extra batteries, full and blank cartomizers, etc. When it comes to organizing all of these supplies, its best to think of long term as well as short term storage techniques. As far as short term storage, you'll want to make sure you have some sort of protection when toting around your e-cig supplies. You can buy special cases and lanyards from Vapor Fi, such as small and large carrying cases. Or, some people go the thrifty route by simply using a toothbrush holder case. Whatever you use, just make certain your e-cig is protected from getting sat on and broken. Also, for short term storage, you should keep an extra battery and full cartomizer nearby. The last thing you want is to be in the middle of vaping when your battery dies or you run out of ejuice. Some people store their supplies in glass jars or a coffee mug, but these doesn't offer as much protection. Long term storage is also important, especially for vapers who choose to buy in bulk. When you'll be holding on to e-cig supplies for a while, be sure to store ejuice in a cool, dark place. Light and heat can change the chemicals in ejuice and cause it to go bad sooner. As for the other supplies, keep them out of heat as well. Ideally, you'll want to find a tackle box, plastic container or some other storage compartment that offers good protection. One thing to avoid is storing your batteries in any type of metal box or material that conducts electricity—otherwise the lifespan of your battery will suffer. If you are packing for travel, then there are some additional organization tips for bringing your e-cig along. 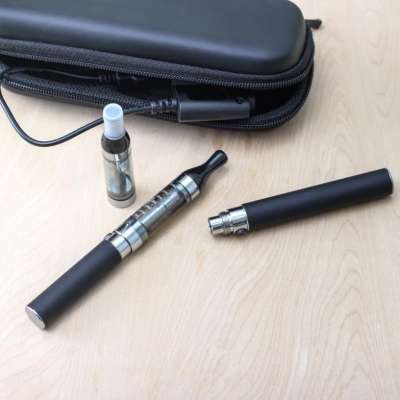 Fortunately, most e-cig products are small and compact, meaning they will pack very well. Just make certain you pack them safely, so that they do not get damaged in your suitcase. We recommend using one of the cases mentioned above or even a small makeup bag. And finally, before you embark on your trip, you should also find out if there are any travel restrictions for e-cigs. Whether you only store your e-cig supplies for short-term, buy in in bulk or travel often, it's a good idea to stay organized and protect your supplies properly. We invite you to check out our wide selection of e-cig accessories that can help you fulfill all of your organizational and storage needs!